NDSU › Publications › Food and Nutrition / Sports Drinks: R They Needed? Sports drinks, such as Gatorade, Powerade and All Sport, contain carbohydrates and electrolytes, such as sodium, potassium and chloride. They are made for physical activity, to help rehydrate and to keep energy levels high. Are sports drinks really necessary? Not always. You can get these same benefits from other sources. A sports drink is not better for you unless you are active for 60 to 90 minutes or are exercising in very hot conditions. Anything less, and water should be the drink of choice. Sports drinks, such as Gatorade, Powerade and All Sport, contain carbohydrates and electrolytes, such as sodium, potassium and chloride. They are made for physical activity, to help rehydrate and to keep energy levels high. Are sports drinks really necessary? Not always. You can get these same benefits from other sources. A sports drink is not better for you unless you are active for 60 to 90 minutes or are exercising in very hot conditions. Anything less, and water should be the drink of choice. Read the Nutrition Facts labels and compare your choices. A bottle of one popular drink is considered four full servings. The label says 50 calories per serving, so do the multiplication. That’s 200 calories for the bottle! You might not even use this many calories during physical activity. Consider the cost, too. Is a drinking fountain nearby? If so, have a drink of water. 1. Dehydration may cause a person to lose some coordination, concentration, endurance and __________. 2. When is a sports drink considered most beneficial? 3. What nutrients in sports drinks aid in physical performance, hydration and energy? 4. What drink is the best choice when active? Dehydration results from not drinking enough fluids. This can lead to health problems and decreased physical performance. You may lose your coordination, concentration, endurance and strength. If you ignore your thirst, dehydration can slow you down. Thirst is not an early warning sign. By the time you feel thirsty, you might already be dehydrated. Other symptoms of dehydration include feeling dizzy and lightheaded, having a dry mouth and/or producing less and darker urine. Water is the best fluid for keeping hydrated. Cool water may help cool your overheated body. • Don’t wait until you feel thirsty to have a sip of water because thirst is a sign that your body has needed liquids for a while. • Drink fluids before, after and during physical activity. Keep a bottle of water with you and take “hydration breaks” every 10 to 15 minutes. • Following physical activity, drink two cups of fluids for each pound lost. • Avoid highly caffeinated drinks. • Try milk or fruit juice. They contain carbohydrates, vitamins and minerals not found in all sports drinks. Milk actually is considered the new sports drink! 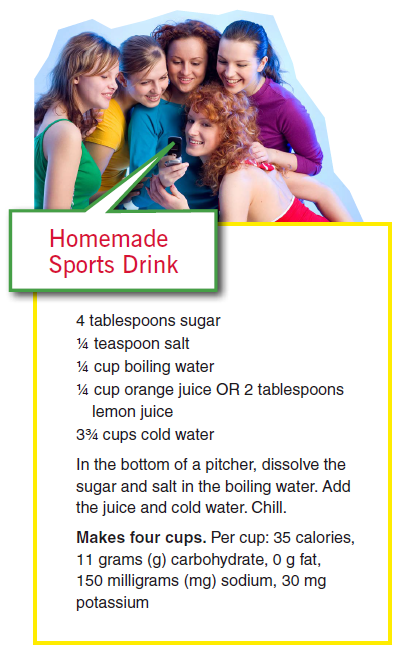 If a sports drink is necessary, try making your own. You will save money and have the same benefits.